To Come Out or Not to Come Out? (The Root) — UPDATED Wednesday, July 4, at 9:45 a.m. EDT: When it comes to the fine line between privacy and hiding, public figures are usually the first to be pushed one way or the other by everyone else's pounding expectations. Should this actress admit to Botox? Should that one fess up about past drug use? Rarely is any debate too small or too big to be dissected. "Putting someone's business out on the street" is just par for the course. Then, of course, there's "the gay question," a personal topic that has grown so increasingly political over the last few months, it's practically unpatriotic not to weigh in on it. In not-so-breaking news this week, Cooper, the CNN news anchor and syndicated talk-show host, came out of a closet that many people never thought he was in. "The fact is," Cooper wrote in an email on the subject of public figures coming out, "I'm gay." But in a society where gay teens remain at a higher risk of being bullied, homeless or suicidal or of abusing drugs — among many of the other ills that disproportionately affect the marginalized — Cooper's coming out (despite a general lack of public surprise) isn't a "Who cares?" moment. Neither was fellow CNN anchor Don Lemon's declaration of his sexuality in May 2011. But there was one difference: Lemon is black. 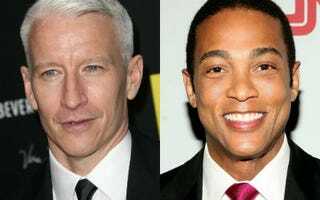 Like Cooper, Lemon was praised for being open about his private life, but he also received criticism, telling the New York Times, "It's quite different for an African-American male. It's about the worst thing you can be in black culture." Plenty of people would argue with Lemon's assertion, which very clearly purports that the black community is somehow more homophobic than most. Michael Arceneaux put it best when he wrote in The Root last year, "homophobia is a collective American societal ill."
Still, for better or worse, when it comes to putting your business out on the street, black celebrities don't necessarily have the best track record. As in most cases of "the Internet said/she said," the gay question remains just that — a question — in the seemingly silly game of who's gay. Just this week, Odd Future crooner Frank Ocean has been at the center of rumors swirling around his sexuality. In a review of his new album, Channel Orange, which drops in the U.S. on July 17, a British writer at This Is Max praised Ocean for being brave enough to open up about his sexuality: "On the songs 'Bad Religion,' 'Pink Matter and 'Forrest Gump,' you can hear him sing about being in love, and there are quite obvious words used, like 'him' and not 'her'." The singer has remained mum on the subject. 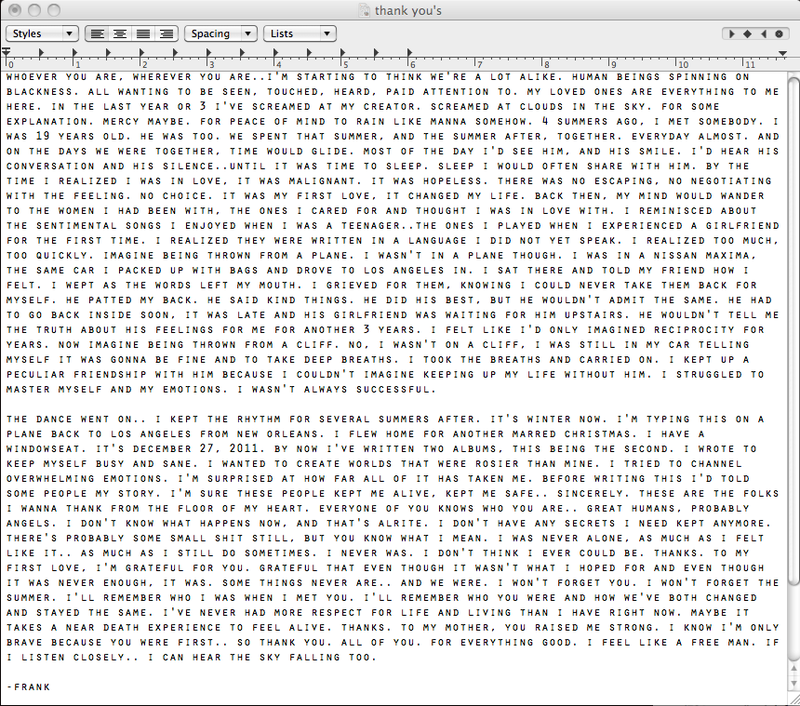 [UPDATE: Ocean has since posted an essay to his Tumblr revealing that his first love was a man.] But that, of course, hasn't halted plans for his coming-out party. AllHipHop.com asked its readers if the singer's sexuality made one bit of difference to them: "Would this stop you from buying or listening to his music?" One commenter replied, "Do whatever you want in your private life, but if you make being gay the focal point of your music I'll have no use for it." In May the National Enquirer — that shining pillar of responsible journalism — quoted several anonymous sources in a story entitled "Raven-Symone Gay Shocker!" that claimed the 26-year-old former child star was shacking up in a "love-nest apartment with her 24-year-old girlfriend." Raven-Symoné addressed the rumors via Twitter, sending two pointed missives in 140 characters or less: "My sexual orientation is mine, and the person I'm datings to know. I'm not one for a public display of my life" and "However that is my right as a HUMAN BEing whether straight or gay. To tell or not to tell. As long as I'm not harming anyone." She's right, of course. Her life, her business. But as Cooper pointed out in his public coming-out letter, remaining silent on a hot-button but very personal political issue can (and will) solidify unspoken shame and the sanctioned discrimination that comes with it. What's a celebrity (gay or straight) beset by such rumors to do? Deny, deny, deny. Ignore, ignore, ignore. Or should that person offer up his or her personal life for public consumption, regardless of the possible dangerous consequences for his or her career, family and friends? Queen Latifah, whose private love life is constantly making headlines, performed last month at the annual Long Beach Pride festival. The crowd was so hungry for an announcement that when Latifah called them "her people" and referred to "unity," the coming-out rumors almost felt real. For her part, Latifah immediately set things sort of straight by telling Entertainment Weekly, "I've never dealt with the question of my personal life in public. It's just not gonna happen." It was a line she's repeated several times. In 2008 she told the New York Times that her sexual orientation is simply off limits. In 2007 she told People magazine the same thing. The list goes on. And yet people still sift through every innuendo for some clue to the 42-year-old's "secret life," which could also be defined as simply her life. Why? Are some of us just annoyingly nosy, or is there something more serious going on? A search for self-acceptance, self-reflection? Dragging anyone out of a closet isn't the answer to increase mainstream visibility of non-heteronormative living. But it is one answer. Just as African Americans call for more positive depictions of themselves in film and television, the doubly or triply ostracized groups that represent LGBTQ (lesbian, gay, bisexual, transgender, questioning or queer) people of color are crying out for the same thing. The difference being that there is a way to be invisible (or, more insidiously, to hide) when it comes to one's sexuality — a chameleon's trick that can't be played out with race in most cases. A black public figure can't suddenly become a white public figure, but a black and gay public figure can easily be presumed black and straight. It's a face-value fact that is both protective and harmful. In Cooper's case, it's true that none of his close friends, family or colleagues were taken aback by his "news." But now, for him, instead of a question mark, there's an exclamation point, or even a period. A final word. What does all this mean when it comes to the multiplied politics of coming out as a black celebrity? Perhaps that, for him or her, there is a measure of responsibility — extremely unfair, but inescapable — to underrepresented LGBTQ people of color, which adds weight to the decision.